​The imposing life-like creature is Owen’s beloved Velociraptor from "Jurassic World" and "Jurassic World: Fallen Kingdom" and was brought to life for the “Raptor Encounter” employing the exact computer-generated model and images used to create her for the big screen. Blue is a welcome new addition to the “Raptor Encounter,” allowing guests to come face-to-face with the clever carnivore. With their intimidating eye contact and ear-piercing screeches that reinforce predatory dominance, each Raptor bares 56 razor-sharp, bone-crushing teeth and lunges forward with curved talons that extend up to 12 inches from their 18-inch-long feet. In 1996, Universal Studios Hollywood redefined theme park thrill rides with the unprecedented introduction of “Jurassic Park—The Ride,” based on three-time Academy Award® winner Steven Spielberg’s epic film. Hailed as a technological achievement of triumph and wizardry, the ride featured newly debuted principles of hydraulic physics, mechanics and space-age robotics. 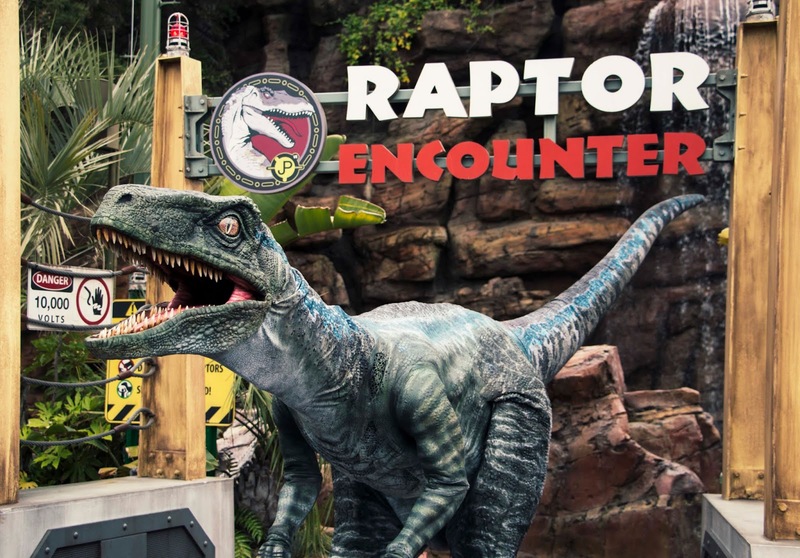 Working in partnership with scientists, paleontologists and aerospace engineers, Universal Creative—the team that develops Universal theme park rides—brought to life one of the most compelling rides ever created. Life-sized and lifelike animatronic dinosaurs, some towering more than five-stories high, freely roamed the earth at Universal Studios Hollywood.